If you’re interested in leaving Hampton Beach, there’s a whole lot to do in the surrounding region. Travel time to the innumerable recreation activities is usually less than 30 minutes. Are you looking for some leisurely activity, like antiquing or indulging yourself in a spa and wellness center? Or maybe you’d lie to cool down at a huge water park? If golf is your thing, there are plenty of challenging courses around too. For those into malls, the Fox Run Mall in Newington is the place to be, while downtown Portsmouth offers many unique shops that attract visitors daily. Just across the river from Portsmouth is Kittery, ME, where you’ll find the famous Kittery Outlets. This shopping area has over 120 stores! If you’d like something more athletic, you’ll find numerous fine public golf courses located in Portsmouth, North Hampton and Greenland. There are also two lush private courses in Rye. The links get crowded in the summer, so it’s a good idea to make a reservation. This may be the time to take a lesson from the course pro and see if you can improve your game. For those into inline skating, skate boarding or biking, the Rye Airfield, located in Rye, offers the ultimate experience. 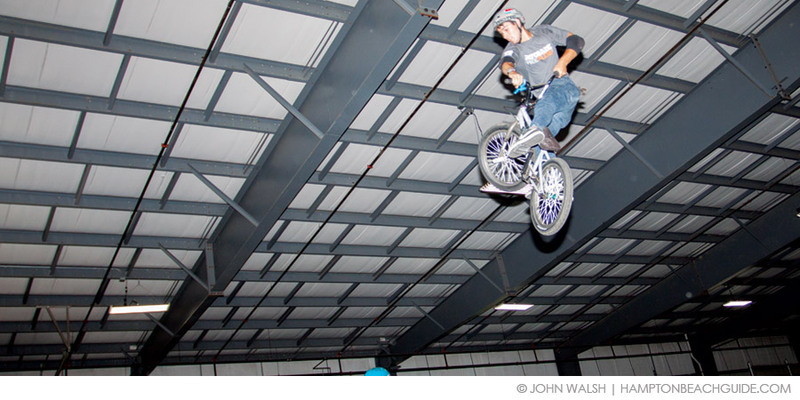 The facility has 50,000-square feet of half-pipes, pools, ramps and much more. There’s also an awesome BMX outdoor super track. The distinct sounds of wheels rolling and boards grinding never stop. Safety gear is required! Water Country, on Route 1 in Portsmouth, is a mammoth water park with about a dozen different slides and water adventures, a river run and a huge wave pool. You can get lost all day in this kid friendly, man-made water world. At the end of the day, take in some papering time at a spa, enjoy a yoga lesson or maybe do a light workout. You want to do something to clear your head and relax your body before you start out for your evening dinner, movie or concert.